Love your card, Joyce, such pretty colors this week. I am back in the lving now...long week, last week! Happy Tuesday! Those are such pretty flowers and all the happy colours give your card such a festive feel!!!! Your sweet card is as stunning as the dress!!!! Oh, I love your choice of blooms and sentiment, and what a great way to add texture to your card...beautiful embossing and stunning card, Joyce! PRETTY card Joyce!! I like the little petals floating down to the single bloom! Love the quilted background on this card Joyce! So pretty! I really like how you quilted the background on this card. The flowers look amazing and that sentiment is fabulous. I love the font too! Oooooh! 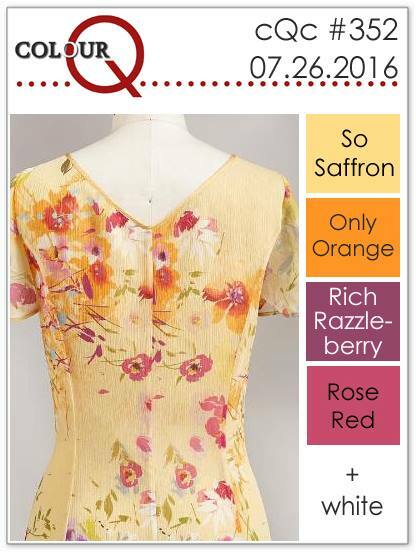 I am crazy about the colourQ this time! and your card is delightful!! Such gorgeous color combo and absolutely delightful layout, and that textured background... Love this card Joecy. A gorgeous card Joyce, it is like I'm seeing that set again for the first time. PErfect time for a little texture, Joyce! OH do I love this card!! !